City-patented, locally produced public toilets are solving vexing problem around the world. The TV show "Portlandia" may be ending this season, but another iconic symbol of the city's weirdness continues to spread around the world — the Portland Loo, a locally designed and constructed commode. It is revolutionizing the way cities solve one the oldest problems in the world, the lack of safe and easy-to-maintain public toilets. Since the first Loo was installed in Old Town/Chinatown in 2008, another 54 have been purchased, most by 20 other cities. Portland hosts 15 of the Loos, while Victoria, British Columbia, and Galveston, Texas, have five each. The farthest one is located along Baldwin Street, the steepest street in the world and a popular tourist attraction in the city of Dunedin, New Zealand. Portland Loos are the only public toilets with their own social media accounts. And a Portland Loo in Vancouver, B.C. was voted the best public toilet in Canada in 2012. Most Portlanders are probably unaware of the Loos' growing popularity. That's because most of the publicity about them in recent years was related to their role in a long-running utility ratepayer lawsuit against the city. Filed in Multnomah County Circuit Court, the lawsuit charged the City Council with misspending water and sewer funds on programs and projects not authorized by the City Charter. Last June, Judge Stephen Bushong ruled that approximately 90 percent of the challenged spending was legal. However, he ordered the City Council to repay the Portland Water Bureau and Bureau of Environmental Services more than $17 million for spending that was not "reasonably related" to their missions. Of that amount, nearly $1.3 million was for water bureau funds spent to develop and build the first Loos. The council settled the case last December for $10 million, without admitting any wrongdoing. The water bureau stopped paying for the Loos well before Bushong's final ruling. The most recent local additions have been funded by Portland Parks & Recreation and installed in renovated city parks. There has been no controversy over their funding. One person who has followed the history of the Loos closely is Greg Madden. His company, Madden Fabrication, makes and sells them out of a converted warehouse in the Guilds Lake industrial sanctuary area in Northwest Portland. "We get a lot of positive feedback about Portland. Everyone wants to replicate our success with the Loos," Madden says. On a sunny but chilly late January morning, the growing popularity of the Portland Loo was apparent at Madden's shop. A completed Loo sat on a pallet in the parking lot, ready to be shipped to Miami. Three workers were assembling another one in a corner of the building. It will be installed in Spring Garden Park in Southwest Portland. Prefabricated parts for future ones were stacked on large shelves outside. "Business is increasing all the time," says Evan Madden, the company's sales manager and Greg's nephew. Loos represent one-third of the company's business, and are increasing by 30 percent a year, he says. His marketing brochure features a pop-up Loo and the slogan, "A unique solution for a universal problem." Most public restrooms are conventional, freestanding buildings with doors that open into fairly large restrooms that include toilets and sinks. But over the past few decades, the behavior of those who use public restrooms has changed dramatically. The restrooms frequently are taken over by drug users, the homeless and the mentally ill, creating safety and maintenance problems for the governments that own them. In many cases, public restrooms were closed down, including in Portland, especially downtown. Early failed attempts to respond are legendary within the public toilet industry. 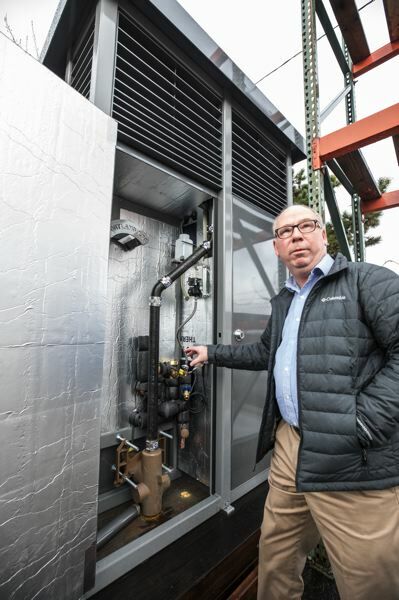 Seattle reportedly spent $5 million on five self-cleaning facilities that suffered numerous mechanical breakdowns and were quickly shuttered. No one seemed to know what to do. "Most of the time, toilets were stuck off in out-of-the-way corners in public space, like no one wanted to talk about them. Of course there were problems," Greg Madden says. 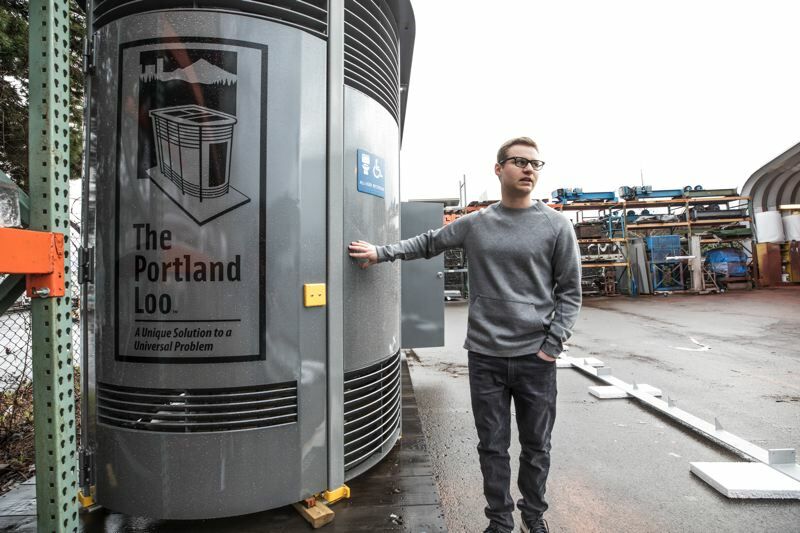 After growing complaints about the lack of public toilets for visitors and the homeless in Portland, activists began a campaign for an affordable, durable and safe design that could be easily installed throughout the city. Former City Commissioner Randy Leonard, who was in charge of the Portland Water Bureau, embraced the idea and appointed a group in 2006 to work out the challenges, including coming up with a design that would be hard to damage, easy to maintain and reduce crime. The group worked on the design with the Portland Police Bureau, Portland Fire & Rescue, and Portland Parks and Recreation. They were assisted by a public toilet advocacy group called Public Hygiene Lets Us Stay Human, or PHLUSH for short, and recognized toilet designer Curtis Banger. Their solution was a single-stall toilet with almost no creature comforts that used the well-recognized concept of Crime Prevention Through Environmental Design. Most of the structure is made of stainless steel with a graffiti-proof coating. There are narrow gaps at the top and bottom so police and others can see if it is occupied without violating the privacy of the users. There is no mirror, because those get broken. There is no indoor sink, because the homeless frequently wash their clothes in them. Instead, there is only a spigot on the outside for cleaning up. At night, an exterior light shines outside until someone enters. When that light goes off, the internal light turns on, so everyone knows it is occupied. The internal light is blue, which makes it hard for drug users to find a vein to shoot up. "The idea was to make it uncomfortable for anyone to stay in there long. There's only one or two things you can do in it, and then it's time to leave," Greg Madden says. 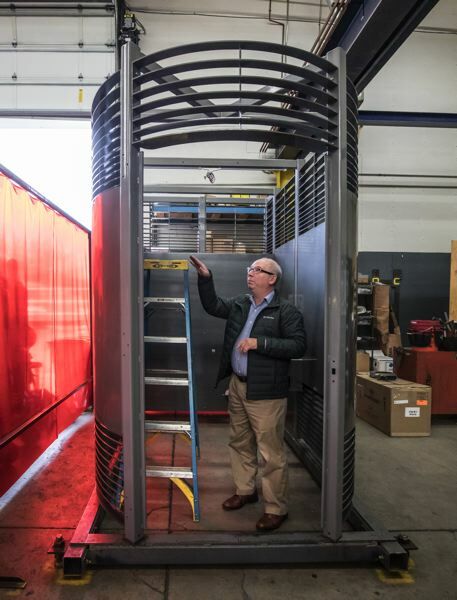 Madden Fabrication won the contract to build the prototype, which was installed in late 2008 near the Greyhound Bus Station on Northwest Glisan Street between Fifth and Sixth avenues. It cost around $140,000. The base price has since gone down to about $90,000, with options — including a heating system for just the toilet — that can push the price to about $110,000. "We way overbuilt the first one. We had some half-inch stainless steel left over from a previous project and used that. It must weigh about 7,500 pounds. But it still looks pretty good after all these years," says Greg Madden. All the other Loos are made primarily out of quarter-inch stainless steel and weigh about 6,000 pounds. When the city approved the next three Loos, Madden's company won the contract for them, too. It eventually struck a deal with Portland to build all of them, and pay an 8 percent commission for any sold outside of town. "Portland has made over $300,000 in commissions so far, which is more than the city paid for the initial design," Evan Madden says. Portland patented the Loo in the summer of 2010. U.S. Patent No. D622,408 S is the first patent the city ever received. Governments buying the Loos are responsible for their installation and maintenance. The restrooms are designed to be placed onto a concrete base with existing water, sewer and electrical connections. Leo Gonzalez, the company's project manager, travels to every installation to make sure everything goes right. "There are been no problems, so far. The quickest one was installed in just two hours," says Gonzalez, one of several employees hired exclusively to refine and build the Loos. 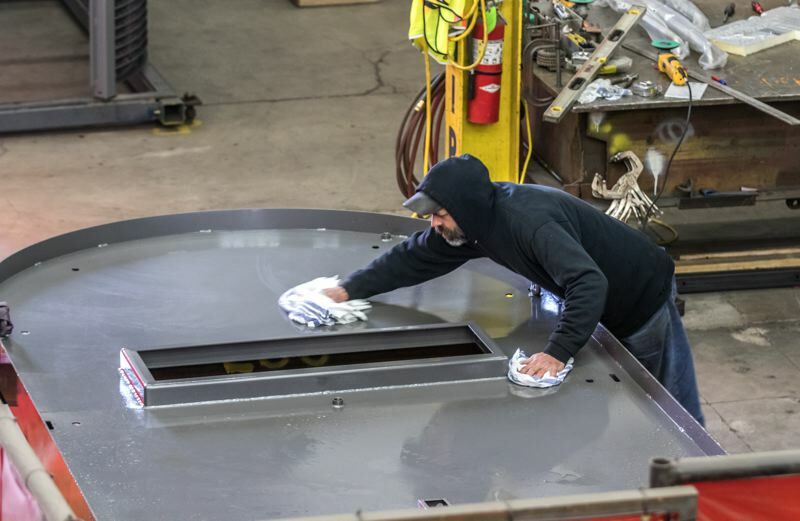 Madden Fabrications is a family-owned business. 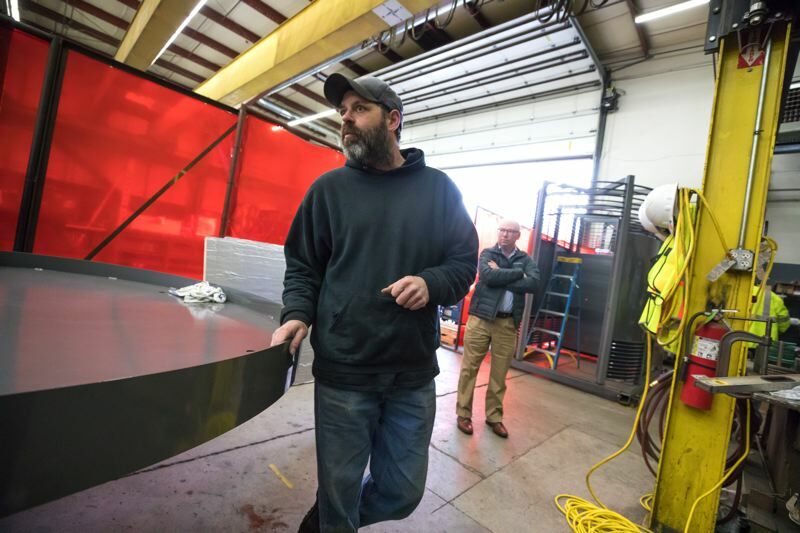 It is a subsidiary of Madden Industrial Craftsmen Inc., which was started over 25 years ago by local entrepreneur Ron Madden, his wife Isabel, and their sons, Greg, Ken and Paul. They built up the business with the assistance of the Portland Development Commission, now known as Prosper Portland. A PDC representative told them the city was looking for a contractor for the prototype Loo in early 2008. The rest is public toilet history. 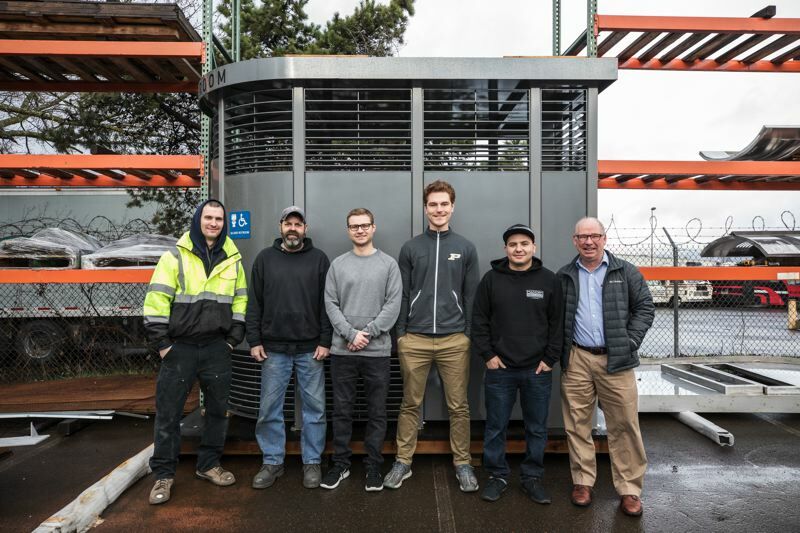 "Portland Loos have helped us grow, and we're doing everything we can to keep improving them and telling Portland's story," Greg Madden says. That includes opening and maintaining a Facebook page, blog and Twitter account for the Loos. They include links to each of the Loos' locations. The Portland Loo even has its own Wikipedia page. • Pixar Animation Studios, Emeryville, Calif.
• Harvard/Cambridge Common Park, Cambridge, Mass. • Missoula Art Museum, Missoula, Mont.